Toronto is experiencing a dramatic spike in the number of bed bug infestations, according to a new report. 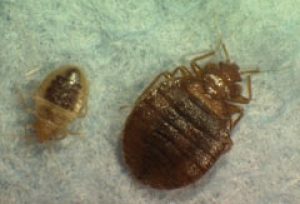 The report, funded in part by the city and the Ontario Ministry of Health and Long Term care, found that over an eight-month period in 2008, Toronto Public Health received 1,500 reports of bed bug infestations. For all of 2003, in comparison, the city’s public health department received 46 such complaints. The report says a rise in infestations isn’t unique to Toronto — Ontario towns like Ottawa, Owen Sound and London have also been hit. Meanwhile, New York City and even some cities in Australia have reported similar spikes in the past five years. More than 100 people —including social workers, MPs and landlords — crammed into a conference room at City Hall on Monday to discuss the report’s findings with its authors. Sean Meagher, one of the authors, blamed the increase of infestations on a lack of awareness of how to deal with bed bugs. He said the problem affects a wide variety of dwellings, from university student dormitories to swanky hotels and low-cost rental housing. Those who have had to deal with infestations have been hit hard, he said. Contact your local health department or a pest control professional immediately to confirm if your home has bed bugs. Inspect your mattress, bed frame and any other nooks where bugs are likely to hide. Vacuum bugs and their eggs, using a nozzle attachment. Wash all linens and sheets in hot water. Seal any cracks in walls, baseboards and floors with caulking. Monitor how many bed bugs you have by leaving out glue boards or sticky tape to catch bugs. If necessary, consult a pest control professional for extermination options. “People suffering from bed bugs frequently experience shame, fear, isolation and insomnia,” he said. Meagher said the bugs are notoriously durable. Toronto resident Fionna Blair is one of the unlucky ones to be hit by an infestation. Two years ago she started getting mysterious bites. She soon found the culprits — bed bugs in her sofa. “They hide very well and only come out at night,” she said. It took lots of money, time and energy spent cleaning, fumigating and even caulking the space between walls and baseboards before Blair got rid of the bed bugs. But even now, she can’t be sure they’re all gone. “They can stay dormant for a year and a half, so they leave you psychologically terrorized … Perhaps you don’t have them, but perhaps they’re just hibernating until they come out again,” she said. The problem could get out of hand unless the government steps in to co-ordinate the response to the infestation, said Meagher. “It will impact all parts of our city. And the failure to act will result in wider infestations and more costly responses. Consistent use of best protocols can and will work, but co-ordination and education are needed to make that possible,” he said.